Luigi Ferrara is a Registered Architect with seal, a member of the Ontario Association of Architects and the Royal Architectural Institute of Canada as well as an Honorary Member of the Association of Chartered Industrial Designers. In 2002, Luigi was appointed the Director of the School of Design at George Brown College. In 2007, his portfolio was enlarged and he was appointed Director, Centre for Arts and Design. In 2014, Luigi was appointed Dean, and worked to expand the school to become the Centre of Arts, Design and Information Technology. He also leads the Institute without Boundaries, the College’s interdisciplinary think and do tank. He has served on the Board of the International Council of the Societies of Industrial Design (ICSID) and was elected President from 2003–2005. He is currently an ICSID Senator. In 1995, Luigi Ferrara founded the Architectural Literacy Forum (ALF), a non-profit organization composed of volunteer architects committed to promoting the public appreciation of the built environment. From 1999 to 2002 Luigi served as President and CEO of DXNet Inc., a network for design and innovation that redefined the practice of design using digital media and advanced computing and telecommunication platforms. Between 1996 and 2002 he was the Vice-President of Programs and Services at the Design Exchange. 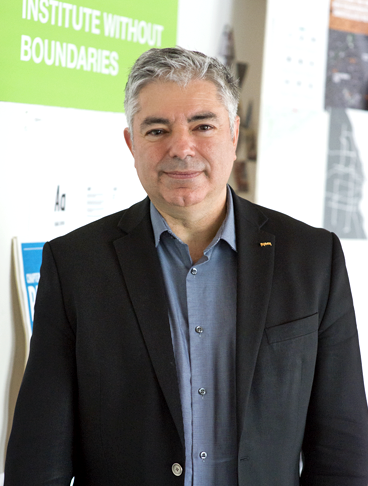 Luigi has served as a principal of Ferrara Contreras Architects Inc. from 1989 to 2007 and now is a partner in the architectural and development firm Conifer Consultants and the strategy firm Co.Ferrara Inc. Early in his career, Luigi worked for the internationally recognized architectural firm Stirling, Wilford Associates, and with local firms Peter Turner Architects, Paul Reuber Architect and Russocki Zawadzki Architects. He is a graduate with distinction of the Faculty of Architecture at the University of Toronto.